On to Godaddy & Up For Sale! Last I reported, Webcam-mate.com showed (in the Whois record http://whois.domaintools.com/webcam-mate.com ) that it was owned by FCI. In fact, it still shows FCI as the owner. For those not in the know, FCI owns Streamate.com. Streamate is in direct competition with Webpower. Until about a month ago, Webcam-mate.com’s site was hosted on Webpower’s servers. A site hosted on their competitor’s servers. Heh! Nothing odd about that. Don’t all companies host their websites on their competition’s servers? Then, shortly after I pointed it out in a blog entry, complete with screenshots, it got changed from Webpower’s servers onto Godaddy’s and now, is up for sale (for a whopping $12.00 at auction!!!) Twelve bucks, mate! I point it out – they change it. So reminiscent of what ICM did with their lawyer, Falco, squatting on domains. 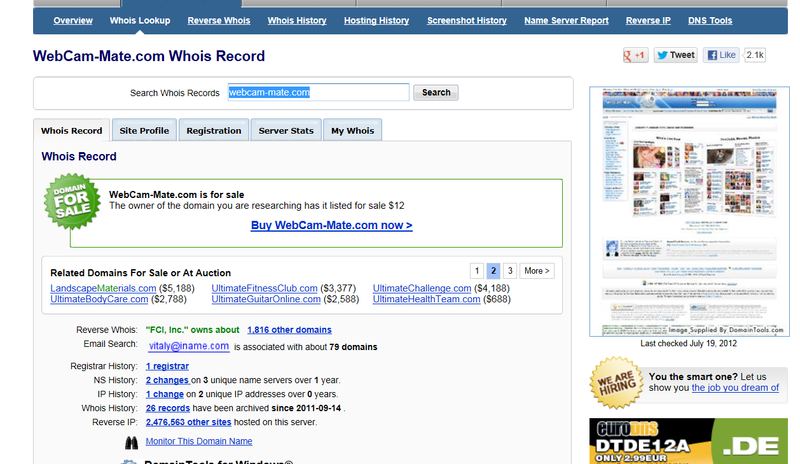 They changed the Whois records and the names within them shortly after I wrote about it. I’m sure Webcam-mate.com will sell for way more than twelve dollars though. I mean, the word Webcam is pretty hot (with the adult website called Webcams.com), and coupled with the mate in Streammate, how can you go wrong? I’m just shocked they didn’t toss in Jasmin and Myfree, calling it MyfreeJasminWebcamMate.com! Hmmm, the name is rather long, but it does have a certain familiar appeal. I guess Webpower’s servers (or their name itself) wasn’t good enough to tack to the seller. Is it at all possible to buy a domain from someone hiding behind Godaddy or does the seller’s name/company/details have to surface at some point? I have no interest in paying Godaddy $5 for a year-long membership to their auction site, just to find out. Interesting stuff indeed. Only in this industry!!! ← Webcam-Mate now OFF Webpower's servers?